Let’s take a look now at some Marvel Comics showing how the Mad Titan has been beaten. On one level, it’s a story about an alien invasion dipping into all these various early 1970s titles, but it’s really all just a big macguffin hunt. Thanos’ debut saga may take its sweet time getting there (originally spanning a year and a half’s worth of publications) but the finale showdown is capital letter “Cosmic”- literally! Okay, even then you get elements like giant Thanos’ nigh-omnipotent abstract space head hurling an entire frikkin’ office building at Captain Mar-Vell and Drax the Destroyer. He evens proceeds to chase them with it through the concrete canyons of Manhattan. Sigh, those 70s sure were some other different time, huh? Mar-Vell gets even by cashing in on Thanos’ overconfidence. Convinced he’s taken all of the Cosmic Cube’s powers into himself, Thanos discards the artifact like a useless trinket. 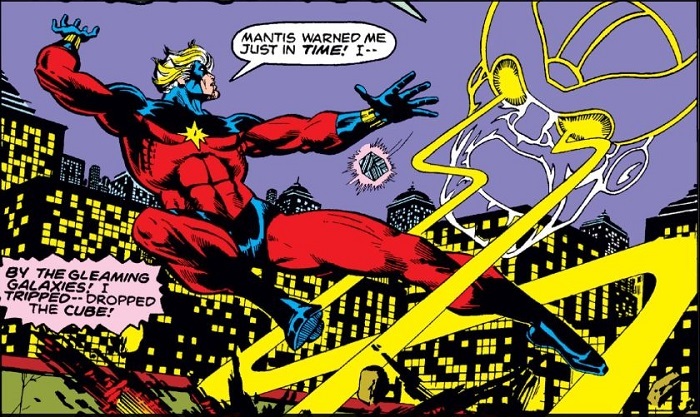 Seemingly using up all of his life’s energies, Mar-Vell smashes the Cube and Thanos’ first attempt at universal conquest is brought to a swift end. Thanos takes his previous defeat as a teachable moment and redirects his energies elsewhere- only now he’s interjecting himself into the exploits of Adam Warlock! Reappearing as less of a space pirate and more as some kind of Machiavellian schemer, Thanos really plays up the “Dr. Doom of the stars” card as Warlock’s new uneasy frenemy as they team up against Warlock’s evil future self, The Magus. However, also like Dr. Doom, he is hiding an ulterior motive for the alliance. Thanos is really interested in Warlock’s mysteriously vampiric Soul Gem. His ultimate goal is to gather all six together and forge a larger, composite seventh gem and utilize it as some kind of giant space laser to eradicate stars and decimate the universe’s population in a tribute to his lady love, Death. In any event, Thanos is opposed by a coalition of Jim Starlin’s All-Stars (Warlock, Mar-Vell, The Avengers). Spider-Man and the ever-lovin’-blue-eyed Thing are along for the ride because, hey, why not? After seemingly killing Warlock and thrashing the Avengers hard, Thanos again seems on the verge of victory. However, Warlock’s essence- now residing in the pocket dimension inside his Soul Gem like some kinda Jedi Force ghost- returns to the land of the living just long enough to launch one final assault on Thanos. In a blinding flash, Warlock petrifies Thanos into unliving stone. After twelvish years of non-use in the character toybox, Thanos re-emerges with what will become his most ambitious plot yet: a combination of his first two plans. Seriously, why do one or the other when you can do both universal scale total omniscience AND mass genocide?! Duh. So, after wiping out half the universe’s population and being confronted by a handful of remaining heroes (sounding familiar? ), Thanos’ schemes are undone by his grand-niece Nebula, fueled by revenge and ultimately diffused by an also-once-again resurrected Adam Warlock. Later, Warlock and Thanos reach a common epiphany about absolute power corrupting absolutely and we get that zen farmer Thanos moment. Although he claims his three times questing for such power is enough, Thanos still gets up to adventuring as part of Warlock’s Infinity Watch- his bad guy days seemingly behind him now??? Okay, so nobody exactly trusts that Thanos is a force for “good” now or whatever. He makes a bunch of questionable appearances in the mid to late 90s and early 2000s but these are no-prized away retroactively as “Thanosi”- bizarro rogue clones that Thanos even “conveniently” helps take care of. Eschewing predictability again, Thanos leans hard into his “space monk” persona and ventures amongst the stars like he’s trying on a new hat. However, once the Annihilation Wave occurs, it seems like it’s back to the side of the black hats for ol’ Prunechin! Although not as forthrightly diabolical as he could be, Thanos’ mad science is instrumental in Annihilus’ efforts to weaponize Galactus as a cosmically unstoppable consumption battery. Unfortunately, Drax is also aboard the ship and is finally able to fulfill the purpose of his creation: kill Thanos! As a stand-off decades in the making, it is rather anti-climatic. Putting it more generously would be the Mad Titan himself: “…Interesting”. In the aftermath of the Annihilation Wave and subsequent large-scale cosmic events, a fissure opens in the very fabric of space itself. On the other side is some unspeakably dark Lovecraftian mirror realm where life has overrun everything to the point that death does not exist. It is dubbed “The Cancerverse”. As Death’s ultimate avatar, Thanos is once again unleashed upon existence. Forming an uneasy alliance with the Guardians of the Galaxy and Earth-born Nova centurion Rich Rider, Thanos enters the rift and takes the fight back to the aggressors. Although the “forces of Death” are ironically the protagonists here, Thanos’ triumphs are not enough to win the favor of his lady love. Shunning him once again, Death abandons Thanos to have the mother of rage-quit meltdowns in the Cancerverse. Realizing that they cannot allow a hyper-jilted Mad Titan back into regular reality, Peter Quill and Nova utilize a Cosmic Cube they just happened to have with them to keep Thanos locked in constant combat inside the Cancerverse, seemingly sacrificing themselves in the process. Only problem with Thanos’ scheme this time is that the Cube in his possession is an imperfect knock-off, a flaw that is exploited by the heroes. Once getting the beatdown over, the Avengers hand Thanos over to a gathering of cosmic bigwigs that he’s also annoyed. Ironically, with all their advance years, the Elders of the Universe have no better parenting skills than most as their version of “time out” only sees Thanos back to bother Earth again within a year. Thanos continues his “back to formula” approach and gets in touch with his space pirate roots. Amassing a group of generals called the Black Order and an army of four-armed vicious dog things, he launches a global invasion of Earth. While it looks like his forces are there for random destruction, Thanos is actually trying to purposefully draw out his hidden Inhuman son, Thane, so that he may murder his successor (in true Thanos fashion). It takes a while for the Mad Titan to cross paths with the Avengers but once the battle is joined, it is the hitherto pacifistic Thane who surprisingly delivers the deciding blow. In the course of his search, Thanos forced Inhuman king Black Bolt into releasing his people’s sacredly transformative Terrigen Mists into Earth’s atmosphere. This grants Thane, among others, strange new powers. His is the ability to instantly kill with the touch of his one hand and to encase a subject in an amber-like tomb with the other. Eventually freed from his amber prison, Thanos next joins Namor the Sub-Mariner’s villainous Cabal. The organization’s goal is to travel to alternate Earths and preemptively destroy them before they are able to collide with the main reality. These “multiversal incursions” continue until only two Earths are left. In this finale, Thanos and company commandeer a life raft-type vessel capable of surviving the literal end of everything. Some time later (to the extent that time can be measured under such conditions), the Cabal is discovered in the ruins of Battleworld- the patchwork planetoid amalgamated by Dr. Doom out of the destroyed remnants of previous realities. Angered that word of these stowaways will upset the delicate cosmology of his “happily ever after”, God Emperor Doom’s forces pursue the survivors across Battleworld. Thanos in particular winds up in the southern region of Battleworld and is instrumental in the collapse of the wall barrier separating the civilized territories from the lawless lands of zombies and killer robots. Personally responding to the crisis, Doom arrives on the scene. 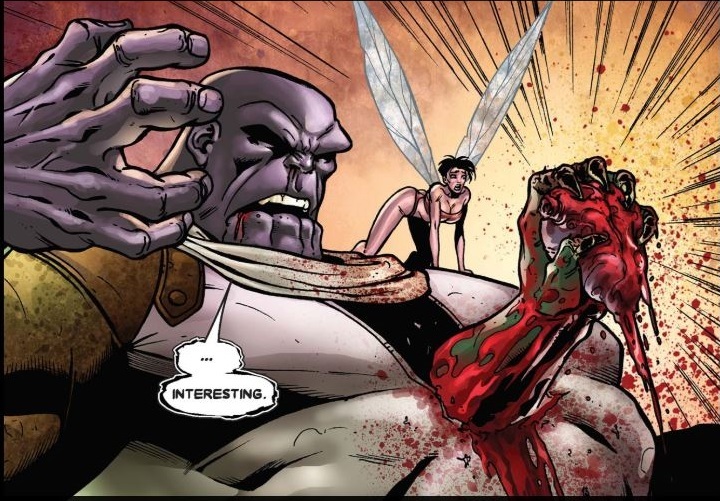 After a brief interaction wherein Thanos smirkingly believes he has the upper hand, Doom effortlessly ends the Mad Titan by removing his spine from his body. Again, another anticlimactic demise. In the aftermath of Secret Wars, reality reconstitutes. However, Thanos finds himself reincarnated in the nothingness outside of the multiverse. A star-faring expedition by the Shi’ar accidentally leads to the Mad Titan’s return to the prime existence. From there, Thanos learns of a new Cosmic Cube project on Earth. A contingency of heroes is prepared to meet him, however there are severe casualties- ultimately leading to a second superhuman civil war. All the while, Thanos remains in incarceration. Additionally, the Guardians have found themselves wrapped up in the Civil War II affairs and inadvertently stranded on Earth. Even though they go their separate ways over the fact that this news leaked to them on an individual “need-to-know” basis (Gamora being Thanos’ daughter and all), they all still rally when the Mad Titan calls for a jailbreak-as-planetary-invasion. Thanos is taken away by the Nova Corps to “space jail” or whatever. Who’s really surprised that he never makes it?? 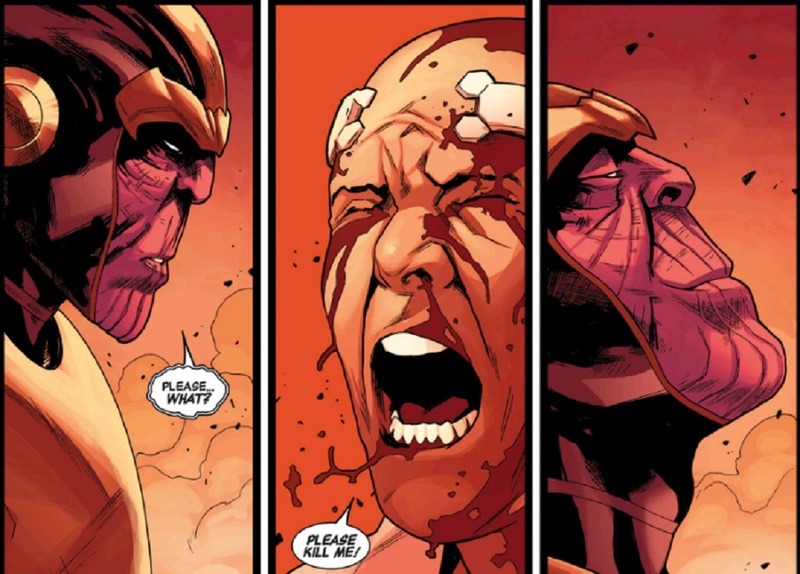 After a protracted power play seeing estranged son Thane utilizing the Phoenix Force against the old man, culminating in a battle at the God Quarry at the edge of time and space, Thanos went on to fight and defy his old king self at the end of time. Although he doesn’t give his older self the thing he wants most (death), he instead returns to present and vows not to become that future self. Ironically, he’s successful in getting head cut off by Gamora shortly thereafter in the prelude chapter of Infinity Wars. In this, Thanos most certainly wins. For more Thanos comics, check out Comic Book Herald’s complete Thanos reading order!